and which is famous for her beautiful river, green fields along it and having produced poets who are important on the history of Japanese literature. 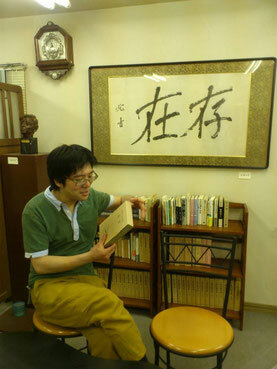 His family managed bookstore at the central town in Maebashi, which began in 1880. His great-grand father Motokichi Takahashi (1893-1965) was famous poet who was a close friend of Hiroatsu Takata (1900-1986, sculptor) and had a intimate friendship with Sakutaro Hagiwara (1886-1942, poet), Muneyoshi Yanagi (1889-1961) and other literary people called Shirakaba, although he kept his career as a bookstore manager and his manuscripts were edited and published by his niece. Zaiya's grand father and mother were both painters as they worked at the bookstore. Zaiya himself had no career at this bookstore, which name is KANKODO (that means "illuminate by fire and calling", from old Chinese saying), but his career as a scholar and pianist surely seems to have roots on it.